As healthcare becomes more customer-directed, employers see value in offering private insurance exchanges for retired employees. In a private exchange, we do all the heavy lifting to create a personalized online portal connected to a specialized agent support team to help retirees select a new plan. Employers gain more control over costs while offering a broader array of health insurance options. Add to that reduced administrate load, and our business clients can create more success in their benefits delivery. 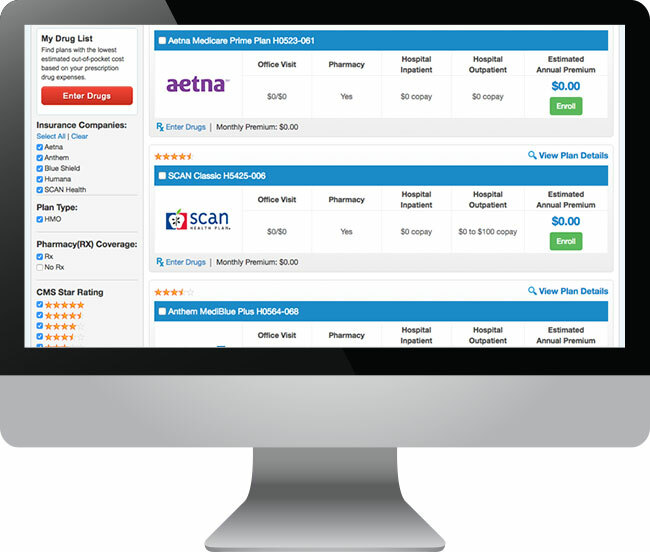 Over 80 health insurance carriers nationwide. More than 7,000 plan options across the U.S.
Medicare supplement, Medicare Advantage, Part D prescription drug plans as well as ancillary and individual products available. Health Retirement Account (HRA) setup with our HRA partner or the HRA administrator of your choice. Single industry dedication means that we can customize everything we do exclusively for our health insurance carriers, brokers, and employer groups. When it comes to Medicare, we stockpile a combined 100 years of CMS practice. Plus, our state-of-the-art technology platforms and expert agent teams are built around helping members find and maintain the right health insurance coverage. HPOne’s exchange doesn’t stop at the online marketplace. We align the online portal with specialized agent teams to guide retirees through the entire plan selection process - through inbound, outbound, chat, and on-demand communication and enrollment. It is the personalized experience that employees expect and HPOne delivers. We only hire highly skilled agents who are trained on the general licensed product and sales. Custom training includes company background, culture, offerings, demographic, and geographic considerations. All of the Medicare compliance and required training happens on day one for all hires. The result is that our skilled team becomes a seamless extension of an employer’s benefits administration. A private exchange shifts the operational, sales and enrollment responsibility to HPOne so the Human Resources staff can focus on what they do best. HPOne’s private retiree exchange can cut healthcare spending by 20% to 40%, and reduce monthly average premium costs to less than $35. Employers and Medicare-eligible retirees pay absolutely nothing to access a company-branded private exchange platform. A private exchange helps employers mitigate possible PR implications that come from shifting retiree benefits while providing retirees greater choice and flexibility. With over 120 insurance carriers and 7,000+ plan options nationwide, retirees are no longer tied to just a single option. Specialized licensed agent teams are able to provide assistance to retirees around the clock during the plan selection and enrollment process, and 24/7 online access. As experts in health insurance, our agents cut the confusion out of healthcare and help retirees understand their options when moving to a defined contribution model. Our broad product offerings and access means that we can meet and/or exceed employer benefit premiums, oftentimes offering much lower (or $0) cost premiums to retirees. More and more government entities are considering transitioning retiree health insurance programs from a group plan to a private exchange. This shift has been prompted by new rules from the Government Accounting Standards Board (GASB). When moving from a defined benefit to a defined contribution model, many retirees need assistance in understanding their options and cost considerations. HPOne has the capabilities, scale, and technology to support government entities seeking to create a dedicated retiree health insurance exchange platform.